I have become completely enamored of the possibilities intrinsic in micropropagation. In our cut flower operation, we have several Leucospermum (also known as pincushions) that Rob raised from seed gathered during a trip to South Africa. Each of these plants is a genetically unique individual. Our crown jewel is a plant we’ve named Coraline for the beautiful, large coral-tinted inflorescences that she bears in wild profusion each year. There is no other plant in the world exactly like her. I want more plants like her as she is also unique in the cut flower world and an economic advantage for our farm. To accomplish this, I am turning to a technique known as micropropagation. Micropropagation allows me to take cell samples from one of Coraline’s growing tips and produce multiple juvenile copies of the plant. With the weird Californian winter weather this year, now is the time to collect the plant material I will need. I will take pictures of this process and document it over the next several months. Today we had visitors to the farm. [I won't say who since I forgot to ask permission if I could mention them in the blog. They're from another local farm.] It was a dreary, wet and cold day but it was good to sit around and jaw about local agri-happenings. Eventually the conversation turned to what could and could not be planted in the local area. Many people mistakenly believe that forested land is inhospitable for food production. To which I say, "If you can build a home there, you can grow food there." The key is to do as the forest does: take advantage of growing space at different altitudes. At Little Grove, the top layer consists of trees between 130 - 170 ft (40 - 50 m) trees. As you get closer to the forest floor the understory consists respectively of madrone, young redwoods and oaks, wild berries, orchids and other flowers, and mushrooms. The fact that these shorter trees and plants exist at all reflect that conditions are suitable for growth. If you pick your crops carefully, they will thrive as well. Many berries do well as understory plants: thimbleberries, raspberries, wild strawberries, paw paw, maypop, and madrone berries. Fungi are not to be excluded or overlooked. A healthy forest ecology is not complete without these subterranean inhabitants. While many mushrooms taste bland or disgusting and some are poisonous, there are a plethora of tasty mushrooms you would be wise to know. For instance, oyster mushrooms are great in soup or a stir-fry, but did you know that they are a natural source of statins, an important class of cholesterol-fighting drugs? I mention them here because they are ridiculously easy to grow in straw, as are many different types of mushrooms. It is important to partner with a local expert or group of expert mushroom hunters to learn what is safe to eat. We, ourselves, are members of the Mycological Society of San Francisco. This group holds monthly meetings, an annual Fungus Fair, and several mushroom hunting trips. Their knowledge is shared freely so that we all can safely enjoy the porcinis, morels, chanterelles, etc. that grow abundantly on forested land. To increase the production of mushrooms on our land, we collect mushroom spores and 'plant' them in areas that each type of mushroom prefers. We have had great success harvesting mushrooms planted in this way after as little as year and as great as three years. While mushroom hunting is very satisfying, it is gratifying to know exactly where to look year after year for almost guaranteed collecting. Knowledge shared by the experts and gleaned from a good mushroom text will let you know the right season to search for the various mushroom species. These lists are not exhaustive but represent a number of the plants we have researched for experimental plantings at the farm. Enjoy farming in the forest! I woke up this morning to a beautiful interplay of trees and fog. We are in the middle of a rain storm this weekend, bringing desperately needed rain to the California watershed. These days, although we have well-water from an aquifer shared with only 2 other families, we take water preservation and conservation very seriously. As you can see from the photo (at right), we have fog and rain on this mountain. 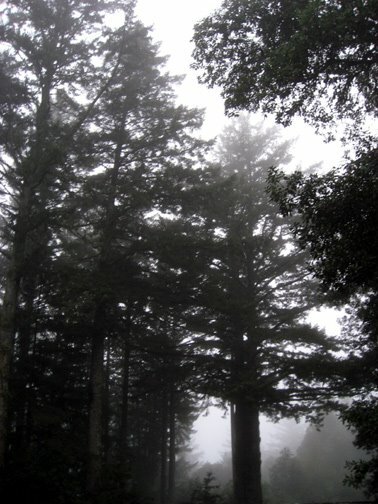 The trees are of the type which capture airborne moisture and turn it into fog drip and we typically receive a respectable number of drenching storms between November 1 and mid-April. 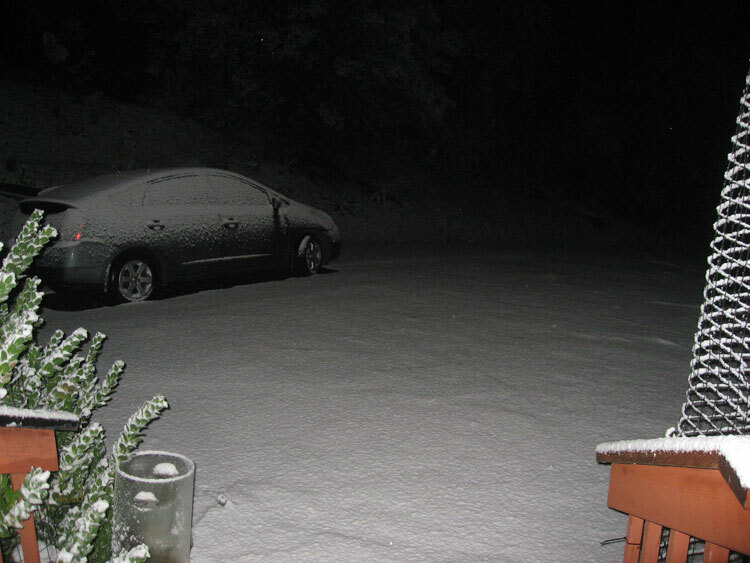 The weather pattern has been changing, becoming less predictable, and the climate seems to have fallen into a rhythm typical of earlier decades with foggy, cold summers and snowy winters (Photo left was taken 12/16/2008). This winter has been troubling due to a delay in any appreciable precipitation until the end of January. Although we intend to dry farm as much as possible, the truth is that even 3 weeks of typical 100+ degree summer weather requires some kind of irrigation. As we increase the number and variety of our plantings and start up greenhouse operations, we feel it would be foolish not to increase the charge of water to our aquifer. We are reaching back to a very low tech technology based on manipulating the land: swales. Swales are sculpted from the land, depressions where rain water can collect and then slowly be absorbed by the ground. The complementary structure to a swale is a berm, a raised lip of land around the swale that keeps the water exactly where desired. The only tool you need to construct a swale is a shovel, although large amounts of land are better worked using a backhoe. We have 3 - 5 acres (out of a forested 10) that we'll be working swales on. If you want to construct a swale, check if it is an unpermitted activity in your county. Building swales does not require a permit in San Mateo County. An alternative to swales would be flat land that has built up a thick duff layer. Alongside our steep driveway, we have encouraged the duff to such an extent that water uphill will not show up downhill, being completely held and absorbed by the soil and duff. I don't know the word for this technique. My husband is, among so many other wonderful traits, a botanist. He has a madness for bulbs and this has been particularly useful in our war against the gophers. 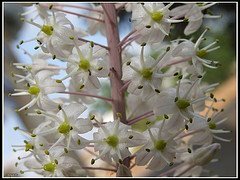 One bulb in particular, Urginea maritima (Red or Sea Squill), is a potent poison and has been used in the past as a rodenticide. Take that, you nefarious gophers! Dig additional hole and plant an Urginea bulb. Smile in satisfaction while eating the fruit because the gophers have left the tree unmolested. The plant has some medicinal utility but is deadly in ruinously small doses. Of additional importance to humans is that a mere touch of the juice from the bulb or its leaves will give you a painful chemical burn. We've warned the kids of the danger and they have respected the distinctive look of the leaves and bulbs ever since. I hope that others in gopher country take advantage of this inexpensive, attractive natural pest control. We have oodles of these bulbs (~100), they are best shipped in the summer when dormant. They have aggressive roots and small bulbs will actually pull themselves down into the ground. So, don't let the cardboard box you moved them in sit on the ground, get wet, and sit around (like he did -L.) or you'll have a spontaneous patch right there. It is the beginning of beautiful day today. We have new fencing to put up as the deer are convinced our wheat is a bed and breakfast. I am going to work to get this site setup in the next few days.